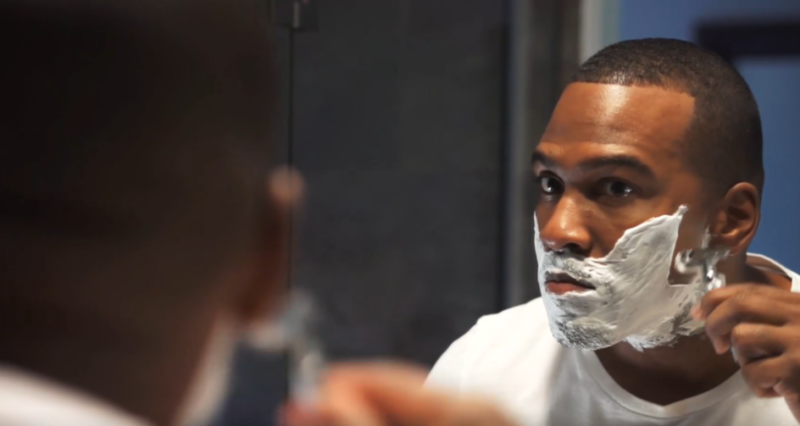 For most guys, their daily routines begin with a shave. Whether it’s the decision of a razor or an electric shaver, the fact still remains, the facial hair’s got to go! But how many of you guys realize that on a daily basis you’re removing facial hair from almost half of your face? Now, that’s a BIG deal! So with that being said, wouldn’t it be safe to say that knowing the proper ways to shave to avoid razor burn, redness, skin darkening (hyper-pigmentation) or unsightly ingrown hairs would be important? I mean, if a good percentage of your face is covered with one or several of these symptoms how healthy could your skin look/feel or really be? Know your face – Knowing the direction your hair grows is best, especially if going against the grain has ever caused you pain. Also, be aware of the sensitive areas of the skin. This way you can prep those areas heavier or leave for last. Moisture – You can never have too much moisture on your face. The wetter and softer you can get your face, the less effort it is to take the beard off. This equals less strokes, which means less time the blade is on your face. If you want it a bit closer, re-lather! Heal & Moisturize – A splash of cold water (or the “Big Chill“) will bring your skin back in balance by calming and also tightening the skin. Then, grab your favorite aftershave balm that’s designed to heal and also moisturize the skin. The healing is especially important because your skin will definitely be going through this process again very soon! PS… Don’t forget the other half of your (from the nose up!). Use a moisturizer to seal-in the moisture on the rest of the face including your shaved areas. Shave areas get double the moisture protection (aftershave balm & moisturizer) this way! Keep it dry – for electric shavers, you need your beard to be dry to the touch in order to maximize the cutting capability of your shaver; never wash you face before. Consider a pre-shave solution – no not a pre-shave oil; in this case the pre-shave solution mimics the pre-shave oil by creating a protective barrier on your skin that allows for a better glide and a closer shave but without the risk of clogging your shaver. These solutions work well with trimmers as well. Brands like: Jack Black , Lab Series, Kyoku carry this item. Sensitive areas 1st – many electric shavers generate heat quickly throughout the course of a shave, and where there’s heat there’s usually irritation (especially if it’s already sensitive). So shave the sensitive areas (i.e. neck) first, while the shaver is still cool. Know your tool – to get the best out of your shaver be mindful of the following: Rotary – shave in small circular motions; Foil – shave with the grain, and against on a case by case basis; Trimmers – work like small clippers, and therefore do a great job of keeping the face clean shaven; use them as you would use your regular clippers. Clean – shavers must be maintained to maximize their cutting ability. For the best daily results clean after every shave, at worst no longer than after every 3rd. For foil shavers specifically, be sure to replace the screen and blades once year. And for all options-DON’T FORGET THE OIL! Aftershave – dry shaving can be just as aggressive as using razors, so the use of aftershave balms designed to – soothe, heal and moisturize your skin are encouraged. Here are two of my favorites! ~ 3 IN 1 Face Balm and 3-in-1 Post Shave. And, never EVER use an alcohol based aftershave since the ingredient alcohol is known to harden and darken the skin. First, wash your face with cool water and a gentle cleanser to soothe skin. Next, apply a dark spot correcting serum to diminish sunspots, then follow up with a deep-acting moisturizer to re-hydrate and help fight wrinkles. Parasol or not, start your day strong by applying sunscreen all over.